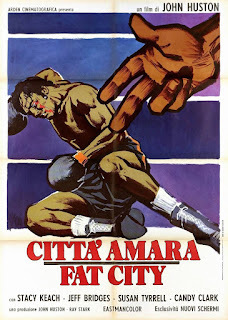 Based on a book by and adapted by Leonard Gardner, Fat City (1972) was directed by John Huston and stars Stacy Keach as Tully, an over the hill fighter who says he wants to pick himself up and revive his career after he meets Ernie (Jeff Bridges), a kid who seems to have a lot of promise in the boxing world. We see their stories parallel and contrast one another as we watch Fat City unfold. Jedidiah Ayres and Heather Drain join Mike to discuss this wonderfully downbeat film. Listen to "Episode 396: Fat City (1972)" on Spreaker.